In my lab I want to be able to start different operating systems quickly – effectively use my hardware as more than one environment. 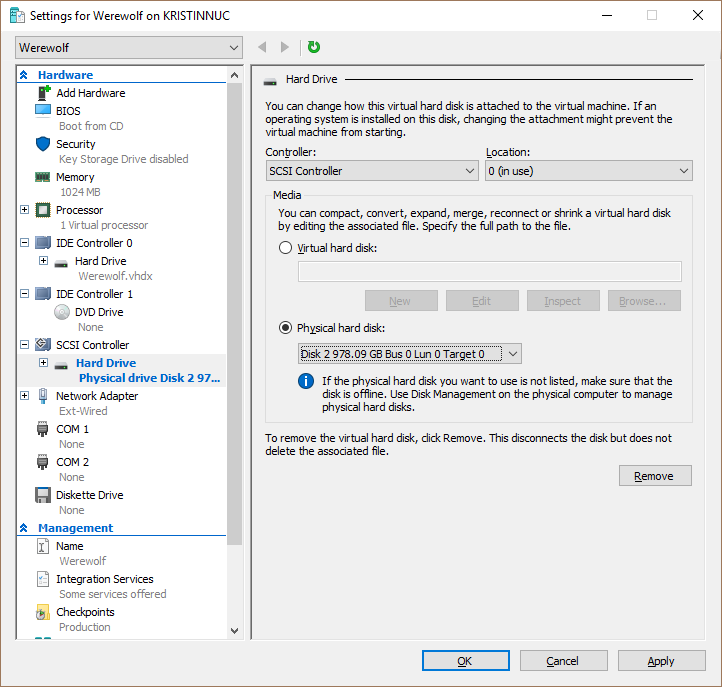 For me, the quickest way to do this is to get some large SSDs, and slap Windows Server 2016 on them, add some VMs in Hyper-V, and now I have a mini lab, contained on one SSD. I also want to be mobile. I want to walk around with my lab on SSD, and be able to plug it in to any PC, boot from it, and be up and running. I got a 1TB SSD, and a USB-C cable. I thought “I will install Windows Server 2016 to this external drive, add the VMs, and be on my way. What to do? I really don’t want to have to connect this drive internally – it prevents the mobility. I had a Windows 10 machine, and on that machine I had setup a Windows Server 2016 VM, and sysprepped it. This was going to be my template that I used to make other VMs for lab scenarios. 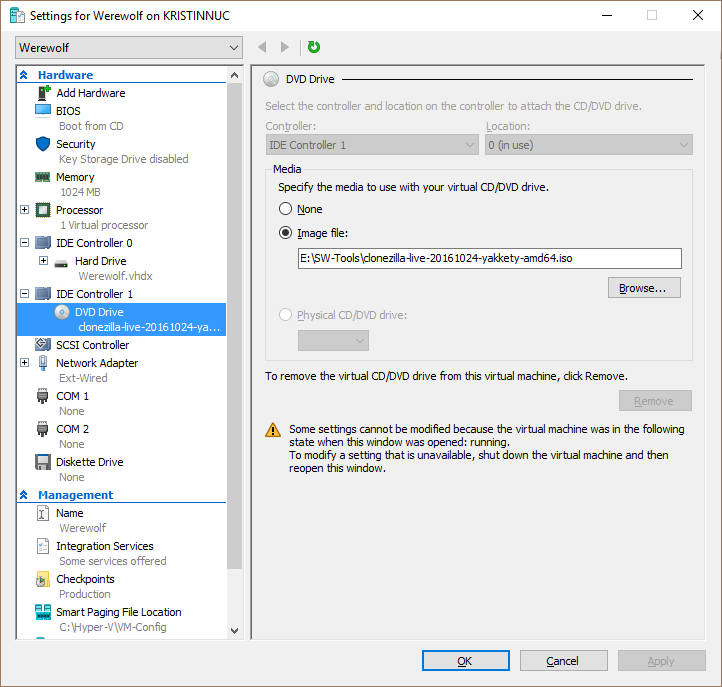 Pass through the external USB-C SSD to the win2016 VM in Hyper-V.
Take the drive offline in the Hyper-V host (in Disk Management). Download the Clonezilla Live ISO and add it to the VM as a DVD drive. Boot the VM to the DVD drive and run through the Clonezilla Wizard to V2P (virtual to physical) the VM to the USB-C SSD. I accepted the defaults. Just make sure you choose the source and target drives correctly. Eject Clonezilla ISO and Shutdown VM. Reboot physical machine and select Boot to USB in the boot options. TADA! The whole process took like 5 minutes, and because the external drive is USB-C and an SSD, its FAST!! !